By the end of 2011, 80% of active Internet users (and Fortune 500 enterprises) will have a “second life”, but not necessarily in Second Life, according to Gartner, Inc.
U.S. agencies offering digital marketing services led the charge as overall agency revenue grew 8.8% to $28.2 billion in 2006, reports AdAge. Billings from traditional advertising and media were up just 4.2%, reaching $13.1 billion. Income from marketing offerings rose from 13.1% to hit $15.1 billion. The ranks of households with a net worth of at least $1 million grew 5% to an all-time high of 9.3 million, according to a report released Monday by TNS. he report covers the year through mid-2006; the value of primary residences was not included. Consumer spending grew at the weakest pace in 6 months in March, despite solid income growth and good news on a key inflation reading in the government's latest measure of the U.S. economy. The weak spending came even as the report showed individual incomes jumped 0.7% in March. Media and entertainment executives see the growing ability and eagerness of individuals to create their own content as one of the biggest threats to their business, according to a recent Accenture survey. The pay-per-click (PPC) industry average click fraud rate jumped to 14.8% for 1Q07 from 14.2% in 4Q06, according to Click Forensics. The average click fraud rate was 13.8% for 3Q06, 14.1% for 2Q06, and 13.7% from 1Q06. China's economy surged 11.1% in the first quarter, causing the country's Cabinet to declare Thursday it will take steps to keep the economy from overheating, reports AP. It was the highest growth rate since Q2 2006's 11.5% growth, the fastest in a decade. Worldwide PC shipments totaled 62.7 million units in the first quarter of 2007, a 8.9 percent increase from the same period last year, according to preliminary results by Gartner, Inc. The Asia/Pacific region surpassed the U.S. PC market to take the No. 2 position in terms of shipments for the first time. Worldwide IT leasing and financing market, encompassing leasing or financing IT equipment, software, and IT-related services, exceeded $70 billion worldwide in 2006, and will pass the $100 billion mark by 2010, growing at a compound annual growth rate (CAGR) of more than 8%, according to IDC. 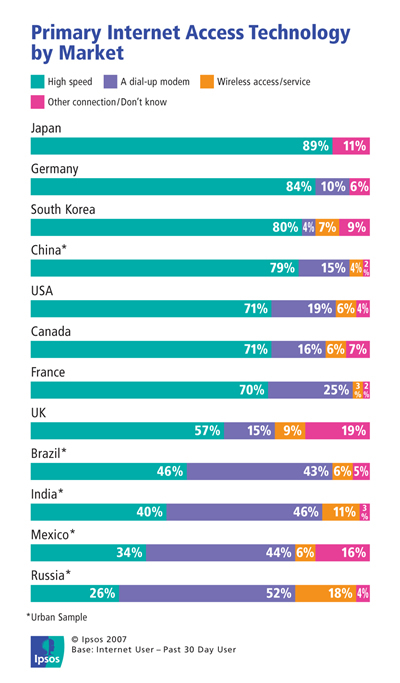 The number of Internet adults utilizing ‘wired’ broadband connections may be peaking, according to results released from Ipsos Insight’s annual The Face of the Web study. At the end of 2006, it is estimated that 77% of the global online population was utilizing a broadband connection to access the Internet. The global broadband market is expanding at a rapid pace, with both equipment revenue and global subscribers expected to increase robustly during the next few years, according to iSuppli Corp. Global broadband subscribers will grow to 622.7 million by 2011, more than double the 270.4 million in 2006. $1-a-year CEOs - Making it Up with Stock and Perks! The heads of Apple, Capital One, DreamWorks and Google each collect a salary of just $1 a year, bucking the trend of digging for a bigger CEO pay packet - the $1 million a year the typical CEO can get, reports USA Today. While some experts laud CEOs for making an important symbolic statement with their $1-a-year salaries, others take a more cynical view. comScore reported the February 2007 worldwide rankings of top Web properties from its World Metrix service, based on unique visitors. Microsoft and Google sites attarcted over half a billion unique users in February, followed closely by Yahoo with 459 million unique users worldwide. China's trade surplus in March fell to $6.9 billion, well below forecasts and down sharply from February's $23.7 billion surplus, reports AP. It was not clear whether the drop in March was the result of government efforts or would have a lasting impact. US online consumer travel sales - airline, hotel, rental car, cruise and vacation package reservations - will reach $94 billion this year, up 19% over 2006, according to eMarketer estimates. Sales will remain strong to hit $146 billion by 2010, although growth rates will steadily decline. India's export of services is expected to touch $310.9 billion by 2011/12, powered by the booming software, consultancy, engineering and tourism sectors, according to the Federation of Indian Chambers of Commerce and Industry (FICCI) survey. Services exports could surpass merchandise exports, which are expected to more than double to $305.5 billion in the next five years. Business activity in the service sector increased at a slower rate in March 2007, according to the latest ISM report by the nation's purchasing and supply executives. The index of business activity in the non-manufacturing sector registered 52.4 in March, down from 54.3 in February. Wall Street was expecting a reading of 54.7. The index is at its lowest level since April 2003. 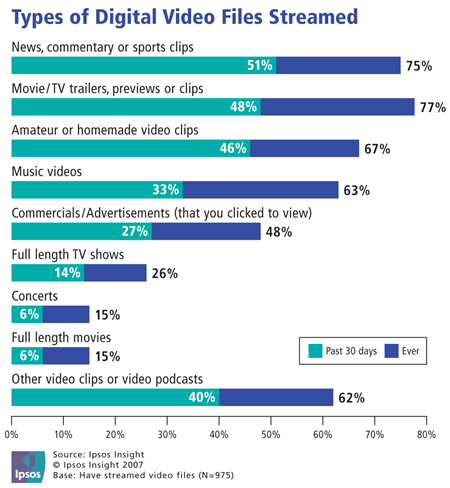 While Americans still love their TVs for watching television programming and DVDs, at the end of 2006, 58% of Americans age 12 or older with Internet access had streamed some form of video content online, according to Ipsos Insight from MOTION - the company’s biannual study of digital video behaviors.